Contributing editor Dr. Pereira continues part 2 of a series on the ISO standards applicable to medical laboratories. The ISO 15189 is widely popular for laboratories, but many aspects are confusing, vague, and misunderstood. Dr. Pereira shows how to interpret the standard's requirements. This lessonis probably the most challenging on the “ISO series update” since many reviews have been published related to ISO 15189 3rd edition . Therefore, this essay is intended only to briefly discuss some specifications and to what is happening with ISO 15189 implementation in the world. The 15189 standard is focused on the medical laboratory, and its goal is the customers’ satisfaction (4 of ). Customers, in this concept, are not only patients but any medical laboratory customers such as blood donors and athletes. The "customers’ satisfaction” can be understood as the contribution of the reported results to an accurate clinical decision. For this purpose, the 15189 standard is based not only on a management system but also a set of medical laboratory technical specifications. While the standard encourages the lab to implement sustainable practices, it is not mandatory. ISO Technical Committee (TC) 212 has developed ISO 15189 (Medical laboratory testing and in vitro diagnostic test systems) Working Group (WG) 1 (Quality and competence in the medical laboratory). ISO 15189 debut edition  was published after a three-year hiatus from the final draft and four years after the publication of ISO/IEC 17025 first edition . It quickly became a widely-accepted standard for accreditation of medical laboratories. The 2nd edition  was published in 2007 to provide the same structure as ISO/IEC 17025 intended for testing and calibration in general laboratories, and it could be viewed as the “ISO/IEC 17025” for medical laboratories. When a medical laboratory chooses an accreditation plan, it should select an accrediting body which operates according to appropriate international standards and which takes into account the particular requirements of this field. Before 2003 medical laboratories could be accredited according to the ISO/IEC 17025 approach, and they were able to change to ISO 15189 at their option. Depending on the accrediting bodies it may be possible for a medical laboratory to choose between ISO/IEC 17025 and ISO 15189 or even to have both accreditations. For instance, when a medical laboratory has ISO 15189 accredited tests and also has a calibration method intended to calibrate not only internal devices (which does not require an ISO/IEC 17025 accreditation) but also equipments for external customers. The difference between ISO 9001 and ISO 15189 approach is that ISO 15189 is direct presence of medical technical laboratory requirements. The 15189 framework provides a quality management system close to the ISO 9001:2008 management requirements, supplemented by specifications for technical competence that are unique to medical laboratories. The standard quality management model is based on the Deming TQM approach   . Figure 1 displays a quality cycle applicable to a medical laboratory under ISO 15189 accreditation. The leadership is critical to the success of all the cycle phases. Probably, on the next guideline revision, “customers” will be replaced by “interested parties,” including not only the clients but others that need to verify lab practices, such as the regulatory and accreditation agencies. This terminology is already revised in the current ISO 9001 edition (4.2 of ). ISO 15189 technical requirements are applied for personnel, accommodation and environmental conditions, laboratory equipment, reagents, and consumables, pre-examination processes, examination processes, ensuring the quality of testing processes results, post-examination processes, reporting of results, the release of results, and laboratory information management. Table 1 summarizes these stipulations. Personnel qualifications documentation, job descriptions, personal introduction to the organizational environment program, training provision, competence assessment per person, reviews of staff performance, continuing education and professional development, and personal records of relevant skills. Quality control procedures design to verify the attainment of the intended quality of results, quality control materials, quality control data, interlaboratory comparisons, analysis of interlaboratory comparison samples, evaluation of laboratory performance, and comparability of examination results. Laboratory and office facilities to provide an environment appropriate for the duties to be undertaken, storage facilities, staff services, patient sample collection facilities, facility maintenance and environmental conditions. Review of results, storage, retention, and disposal of clinical samples. Equipment: Documented procedure, acceptance testing, instructions for use, calibration and metrological traceability, maintenance and repair, adverse indented reporting, and records. Reagents and consumables: Documented procedure, reception and storage, acceptance testing, inventory management, instructions for use, adverse incident reporting, and records. Report of examination results, the report attributes, and content. Documented procedures, information for patients and users, request form information, first sample collection and handling, sample transportation, sample reception, pre-examination handling, preparation, and storage. Documented procedures, automatic selection and reporting of results, and revised reports. Examination procedure selection which has been validated for their intended use, verification of analysis procedures, validation of test methods, measurement uncertainty of measured quantity values, biological reference intervals or clinical decision values, and documentation of testing procedures. Authorities and responsibilities, and information system management. The medical laboratory participates in programs to calibrate and verification of trueness, i.e., to determine and verify bias (systematic error analysis) defined as “the difference between the expectation of the test results and an accepted reference value” (2.18 of ). Measurement Precision (random error analysis) is also measured and verified. It is defined as “the dispersion of independent results of measurements obtained under specific conditions, is expressed such as standard deviation or coefficient of variation”(2.15 of ). Preferably, traceable metrological materials should be used. When these materials are not available, or its use is not significant to the estimate of accuracy, alternative materials could be used. For a deeper discussion see [10-12]. 5.5.1 Selection of examination procedure: New tests are selected per its clinical purpose (intended use). For instance, a screening test selection in a blood bank should assure that a method with a high diagnostic sensitivity  is chosen to minimize the residual risk (2.29 of ) of post-transfusion infection. ISO 15189 does not recommend any approach to select a new test. Usually, it is based on a literature review using validation cases of state-of-the-art methods. 5.5.1.2 Verification of examination procedure: All tests used without modification are verified using performance information data available from the manufacturer. The verification shall provide evidence that the laboratory performance claims have been met. 5.5.1.3 Validation of examination procedure: All tests are validated according to the clinical test purpose/intended use/ impact of the result on the clinical decision. Therefore, the specifications, such as the allowable total error, diagnostic sensitivity, and diagnostic specificity are selected accordingly. ISO 15189 does not state any approach for method validation, and it does not state any goals/targets/claims. The calculations are based on experimental data. 5.5.1.4 Measurement uncertainty: ISO 15189 does not recommend a methodology to the measurement uncertainty evaluation, even though calcluating measurement uncertainty is required. However, since ISO is a member of the working groups of the Guide to the Uncertainty of Measurement (GUM)  and the Vocabulary of International Metrology (VIM) , it is presumed that an “Uncertainty approach” () model is mandatory. Empirical models should be used, preferably using data from the validation of the examination procedure phase. It is not recommended to use external quality assessment (EQA)/proficiency of testing (PT) data as a primary source due to the heterogeneity of the results . However, the EQA/PT is probably the most common model in medical laboratories with tests accredited to ISO 15189. It does not comply with the standard since usually, this determination is not according to the intended use (clause 5.5.1.4 of ). ISO 15189 2nd edition required that measurement uncertainty is determined when its result was “relevant” and “possible” (5.6.2 of ). “Relevant” could be interpreted as when the outcome has a significant clinical value, and “possible” synonymous of the availability of a mathematical model. Such as the total analytical error based on “Error Approach” (also documented as Traditional Approach or True Value Approach), measurement uncertainty is part of the evaluation of the quality of the reported result, which could be applied to any measurement. Despite the mandatory requirement to calculate it, and the elapsed time of more than 23 years since the GUM was published Measurement uncertainty implementation has never been successfully adopted or applied in medical laboratories. We can see evidence of this in the Westgard MU 2015 survey . For further details about models to determine measurement uncertainty in medical laboratories see . Internal quality control: A design of internal quality control scheme is applied, but no aproach is recommended any approach. For most of the methods the "Westgard Rules” are used, however its application does not always fulfill its principles , and there is not a harmonized practice. An alternative to the Levey-Jennings charts could be used, such as the exponentially weighted moving average (EWMA) chart (9.2 of ). Nevertheless, it is suggested a statistical design of the QC based on the Sigma-metrics  principally because it relates the determined total error with the allowable total error. The allowable total error is equivalent to the error that does not significantly contributes to wrong clinical decisions. For a depth discussion on this issue, please see . External quality assessment: Medical laboratory shall participate in programs for EQA/PT and shall document evidence corrective actions when results are deemed out of control. For instance, when a result is outside of the acceptable group requirements. There are no recommended approaches. The use of EQA/PT approach is sometimes misunderstood, for what some calculus based on its data could not be consistent. For example, it could be an unreliable source for an estimate of bias if the group discrepancy is too large. 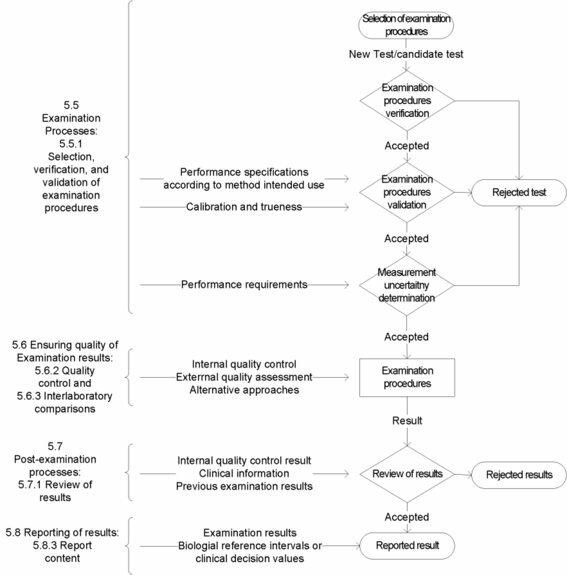 Figure 2 represents the steps from the test selection to the reported results. The accomplishment of the examination and post-examination phases are dependent on the pre-examination stage. Figure 2. A flowchart for activities of the examination an dpost-examination stages. Which books are suggested to support the ISO 15189 quality management system? Principally two publications: David Burnett, Ph.D. “A Practical guide to ISO 15189 in laboratory medicine” (2013), and James Westgard, Ph.D. and Sten Westgard, M.Sc. 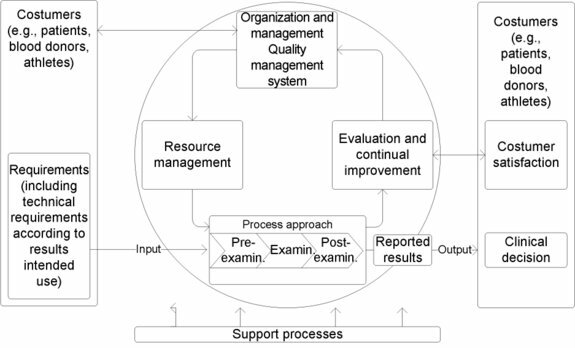 “Basic quality management systems” (2014). Which references can support ISO 15189 specifications on examination and post-examination activities? See Westgard QC Risk management essays, Six Sigma risk analysis (2011) book, and CLSI EP18 and EP23. Which software intended to the medical laboratory is available? For the validation of examination procedures is suggested Medcalc (MedCalc Software bvba), EP Evaluator (Data Innovations), and Analyse-it (Analyse-it Software, Ltd.). 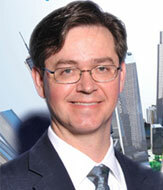 Dietmar Stöckl, Ph.D. offers a huge number of spreadsheets helpful to validation on STT Consulting. For measurement uncertainty is recommended the MUKit (SYKE). This is a freeware based on . For IQC there are several software available, some based on Web services. For QC design based on Sigma-metrics, there is EZ Rules (Westgard QC). Are there guidelines to support metrology requirements (subchapter 5.3.1.4)? Yes, ISO 10012:2003  is the standard for the control of monitoring and measuring equipment. There are several of other ISO guidelines for verification and validation of equipment, such as the ISO 8655 series for pipettes. Please, search ISO Web site. Most of organizations on metrology, such as International Bureau of Weights and Measures (BIPM), European Association of National Metrology Institutes (EURAMET), European Federation of National Associations of Measurement, Testing and Analytical Laboratories (EUROLAB), EURACHEM, Cooperation on International Traceability in Analytical Chemistry (CITAC), National Institute of Standards and Technology (NIST), and Instituto Portugues de Acreditacao (IPAC) have a huge number of free guidelines. Part 3 of this series will focus on metrology requirements. Are there guidelines based on the audit requirements (4.13)? Yes, ISO 19011:2011  “is intended to apply to a broad range of potential users.” It is the recommendation to support the audits, including the documented procedure. Part 4 of this series will be oriented to audit requirements . Are there guidelines to support the safety specifications (5.2)? Yes, ISO 15190:2003  is the complementary standard to ISO 15189. Part 5 of this series will be based on safety requirements. What is happening with ISO 15189 implementation on a global perspective? Currently, ISO 15189 is obligatory in Australia and Latvia. Since 2011, all new French medical laboratories must be accredited. Since November 1, 2016, all other public or private laboratories in France must be accredited on at least 50% of the tests, expanding to 70% of tests by 2018, and all tests by 2020. In the Netherlands, the CCKL accreditation has been changing to the ISO 15189 standard under the direction of the Dutch ‘Raad voor Accreditatie’ (RvA), with a target deadline of January 1, 2018. Thus, the implementation case of ISO 15189 at a global perspective could be seen as currently unsuccessful, since only a few countries here and there have adopted it wholesale. This is very different than the rapid and widespread adoption of ISO/IEC 17015 in other science fields. On a harmonization perspective of good laboratory practices, the slow uptake of 15189 is a major concern. Nevertheless, while ISO 15189 is not mandatory in most countries, this standard does remain the most common global reference for quality in medical laboratories. Its influence around the world cannot be overstated. Test accreditation according to ISO 15189 has several advantages. Infrastructure to correctly support the operation practices. The safety specifications are basic. International Organization for Standardization (2012). ISO 15189 Medical laboratories - Requirements for quality and competence. 3rd ed. Geneva: The Organization. International Organization for Standardization (2003). ISO 15189 Medical laboratories - Particular requirements for quality and competence. Geneva: The Organization. International Organization for Standardization (1999). ISO/IEC 17025 General requirements for the competence of testing and calibration laboratories. Geneva: The Organization. International Organization for Standardization (2007). ISO 15189 Medical laboratories - Paricular requirements for quality and competence. 2nd ed. Geneva: The Organization. Feigenbaum, A (1956). Total quality control. Harvard Bus Rev, 34(6):93-101. Deming, W (1982). Quality, productivity, and competence position. Cambridge (MA): Massachusetts Institute of Technology, Center for Advanced Study. Juran, J (1983). Upper management and quality. 4th ed. Wilton (CT): Juran Institute. International Organization for Standardization (2015). ISO 9001 Quality management systems - Requirements. 5th ed. Geneva: The Organization. EURACHEM/CITAC. (2003). Traceability in chemical measurement. Europe: The Organizations. Retrieved from: http://www.eurachem.org/images/stories/Guides/pdf/EC_Trace_2003.pdf. Clinical and Laboratory Standards Institute (2006). X-05R Metrological traceability and its implementation, A report. Wayne (PA): The Institute. Vesper H, Thienpont L (2009). Traceability in laboratory medicine. Clin Chem 55(6):1067-1075. Pereira P, Westgard J, Encarnação P, Seghatchian J (2015). Evaluation of the measurement uncertainty in screening immunoassays in blood establishments: Computation of diagnostic accuracy models. Transfus Apher Sci 52(1):35-41.
International Organization for Standardization (2012). ISO 31000 Risk management - Principles and guidelines. Geneva: The Organization. Joint Committee for Guides in Metrology (2008). Evaluation of measurement data - Guide to the expression of uncertainty in measurement. JCGM 100:2008, GUM 1995 with minor corrections. JCGM. Pereira P, Magnusson B, Theodorsson E, Westgard J, Encarnação P (2015). Measurement uncertainty as a tool for evaluating the ‘grey zone’ to reduce the false negatives in immunochemical screening of blood donors for infectious diseases. Accred Qual Assur 21:25-32. Westgard QC (2016) MU Survey 2015: The Global Results. http://www.westgard.com/mu-global-survey.htm. Accessed: February 13, 2017. Pereira P (2016). Uncertainty of measurement in medical laboratories. In book: Luigi Cocco (editor). New Trends and Developments in Metrology. Rijeka: InTech. . Retrieved from: http://www.eurachem.org/images/stories/Guides/pdf/EC_Trace_2003.pdf. Accessed: February 13, 2017. Westgard J, Barry P, Hunt M, Groth T (1981). A multi-rule Shewhart chart for quality control in clinical chemistry. Clin Chem 27(3):493-501. Montgomery D (2012). Introduction to statistical quality control. 7th ed. Hoboken (NJ): John Wiley & Sons, Inc.
Westgard J (1992). Charts of operational process specifications (“OPSpecs charts”) for assessing the precision, accuracy, and quality control needed to satisfy proficiency testing performance criteria. Clin Chem 38:7:1226-1233. Westgard J (2006). Six Sigma Quality Design and Control. Madison (WI): Westgard QC. Magnsson B, Näykk T, Hovind H, Krysell M (2011). NordTest NT TR 537 Handbook for Calculation of Measurement Uncertainty in Environmental Laboratories. 3.1th ed. Oslo Nordic Innovation. Retrieved from: http://www.nordtest.info/images/documents/nt-technical-reports/nt_tr_537_ed3_1_English_Handbook%20for%20Calculation%20of%20Measurement%20uncertainty%20in%20environmental%20laboratories.pdf. Accessed: February 13, 2017.
International Organization for Standardization. (2003). ISO 1012 Measurement management systems - Requirements for measurement processes and measuring equipment. Geneva: The Organization. International Organization for Standardization (2011). ISO 19011 Guidelines for auditing management systems. 2nd ed. Geneva: The Organization.